Since the presidential election that led to Donald Trump's victory, we've learned that Democrats are apoplectic, establishment Republicans are aghast (but slowly coming around to their new party leader), and millions of Americans are elated that someone from outside the political establishment is going to shake up a broken political system, one way or another. The mainstream media will also happily navel gaze and tell you about liberal-elite bubbles that need to be burst and how Middle America is finally getting back at the establishment class for being ignored for decades. And, of course, you can learn all about how petrifying and/or a breath of fresh air President Donald Trump will be (although, you most likely will not hear both sides of this argument, thanks in large part to what is discussed in topic #5 below). All of the above are worthy of discussion, but if we only focus on the what's and don't invest in exploring some of the why's, we won't come away with the full understanding of what was behind Donald Trump's stunning victory. If we take the time to understand the why's, perhaps we can be better prepared to be active participants in our own society and future rather than being mere spectators and consumers of news. Social liberals have historically had empathy for minority demographics in America - blacks, latinos, Muslims, Jews, and even Catholics earlier on when they were seen as the most unsavory immigrants. In modern politics, these communities were primarily urban in nature. As a result, the Democratic platform has signaled through rhetoric and symbolism that it is an urban-first party. Yet, over the last several decades there has been a slow decline of the rural American experience, driven by the loss of jobs due to globalization and the constant churn of technology advancement -- punctuated by an increase in crime, drug abuse and, most importantly a loss of communal self-esteem. One can imagine how annoying it must be for rural voters to be living in increasingly hopeless towns across rural America only to hear Democrats -- the party that's supposed to care the most about the struggling citizen -- talk about economic and social issues primarily focused on urban and suburban voters. It can be argued that because Clinton received over one million more votes than Trump there wasn't -- and isn't -- anything wrong with the party platform. However, because national elections are tied to the electoral college, Democrats will now be compelled to think about rural issues disproportionately to the population mix. Make no mistake: voters from Rust Belt tilted the balance that led to Donald Trump's legitimate election, ensuring that they become a strategic political block for as long as the current sociodemographics persist. Further (and this may be controversial, but it must be addressed), Democrats' empathy seems to be completely blind to rural conservative voters. Whenever there are significant progressive social wins in our culture (i.e., gay marriage, transgender civil rights, the rights of the state winning over the rights of religious doctrine), there seems to be absolutely no plan to provide an on-ramp for those less urbane people who are not racists or bigots, but still get freaked out by these evolving values in their country. There is precious little Democratic energy expended in trying to understand and help those who feel like this is "no longer their country." Rather, Democrats, liberals, and progressives dance in the street and celebrate their civil rights wins, throwing salt in the cultural wound of at least 20-30% of the country (if not more). That's a lot of people who may agree with the Democrats' fiscal and government policies (i.e., Social Security, Medicare, environmental security, and foreign policy) who are instead turned off by a disregard for their slower adoption of progressive social values. Instead of helping them along the path of social justice, Democrats are seen as demonizing these people as racists, bigots, and deplorables who just need to get on board with social progress, like it or not. This is lazy, sloppy population management, and almost guarantees a backlash. Perhaps even a big-league backlash! The election of Donald Trump is just as much a story of the failure of the Republican party as it is the Democratic party. Let's not forget that Trump bulldozed over sixteen Republican contenders in the primaries. Traditionally, Republicans have stood for fiscal discipline, small government values, a strong military, and pro-gun and pro-life policies. Because they too are in a bubble, they believed that these fundamental legs of their platform all fit nicely together. Turns out their coalition in today's America is actually about jobs, guns, and abortion. The fiscal discipline and small government ideals were just part of the package deal. This is akin to your cable provider bundling ESPN, FoxNews, HGTV, and the Let's Learn Spanish channels together and then proclaiming that the majority of their customers want to learn Spanish! Donald Trump's candidacy popped the bubble of this Republican "package deal" and showed the nation that many people -- no matter the political party -- want the government to help them when they feel marginalized, hurt, or in need of help. The fiscal discipline philosophy that Republicans are so famous for was not -- and may not be -- the overarching philosophy that wins majorities in elections. The key swing voters in the Rust Belt seemingly want just as much government as Democrats typically want -- they just want it targeted toward them rather than aimed at minority populations in far-flung cities on the coasts. To wit, Donald Trump's platform sends the national debt skyrocketing, even more than Clinton's plan. Isn't it interesting how few debate questions were debt-focused, especially given how much the national debt was a defining issue during the Obama administration? This election has shown us that the national debt -- and fiscal conservatism in general -- is nothing more than convenient political outrage with no real philosophical conviction when it comes to mainstream voters' values. The upshot of this realization is that both parties are now aware that they need to play the same ignore-the-debt game: The Republican party can no longer afford to believe that their voters' fiscal responsibility desires are philosophical in nature. None of this bodes well for our national debt or deficit, but the good news is that it all may be a bit of a red herring anyway. Candidates that win don't just have a message; they have a story that connects with the issues of the day. Often, presidential campaign stories are built on hope and optimism, latching onto the civic religion that is the American Dream. Candidates like JFK, Ronald Reagan, Bill Clinton, and Barack Obama all ran on story platforms designed to connect their policy prescriptions to the future well-being of America. Donald Trump followed in this tradition but in an unconventional manner. Unlike prior winning campaigns, Trump focused more on the problems the country faced through a lens of victimization and de-emphasized specific policies that would enable a change in the status quo. Trump convincingly told a story of an America seen through the eyes of people outside of our bustling and thriving top-20 urban centers: a story of an America that used to be strong, proud, wealthy, and durable that had slipped away -- aided and embedded by politicians in Washington and other Big Elite Cities who prioritized their lives over your life. Global trade, costly wars, Wall Street bailouts, outsourcing, and technology automation... all "elite" activities that benefit those at the top, leaving those at the bottom scrambling for scraps; holding their hands open, hoping to catch just a smidge of this new kind of coastal elite trickle-down economics. He summed all of this up with the slogan "Make America Great Again." His slogan succinctly summarized the narrative, which re-enforced the message. It should be no surprise that many voters saw Bernie Sanders and Donald Trump as the two most engaging candidates this season, as their stories had many commonalities when describing the challenges the country faces. While their stories had much in common, their stories' antagonists were quite different, and as follows, their prescriptions for the country were quite divergent. Many in the media were consistently stunned during the primaries when they found voters torn between voting for Donald Trump and Bernie Sanders. Good journalists know the power of stories and they should have known better. Bernie's campaign was stymied, however, by a lack of an effective slogan that telegraphed his story beyond his followers. "A Future To Believe In" is vague and distant, and "A Political Revolution is Coming" could sound overbearing -- if not petrifying -- to a voter that is not politically-minded and is just looking for a better job and maybe some hope for a secure retirement. Hillary Clinton rode into the nomination primarily on a coronation story -- a story of "I'm smart, experienced, and determined to be the first woman President of the United States." Well, that story was about her, not them. Her campaign logo even stated "I'm with Her" for crying out loud. What a self-centered story! Her latter campaign slogan became "Stronger Together" as a reaction to Trump's campaign. The story "Stronger Together" broadcast to voters was that Clinton's campaign was going to be more inclusive and empathetic. This is effective to progressives and liberals, but didn't convey a sense of action or progress. Ironically, the candidate that advocated "Stronger Together" was the same candidate that declared that a portion of Trump's voters were deplorables. Not the most effective way to re-enforce the message to a broad audience. Not just in politics, but in life, charisma is the most under-examined and under-measured component in effective leadership. You might have the best story in the world, but if you can't deliver it with conviction and in an attractive, engaging manner, your story will never gain legs. Charisma may be the most important ingredient of leadership -- and in winning national elections -- yet it is oddly ignored and unexamined in election and campaign analysis. Donald Trump had the rockiest and most gaffe-driven campaign in modern history, yet he glided by these supposed deadly gaffes and emerged stronger than ever after each. His sixteen Republican rivals all had better resumes, temperaments, relevant experience, and real governing track records to prove to the voters that they should be entrusted with America's future and fate. But if you look at the Republican candidates through the charisma filter, you'll see a yuge gap between all of them and Trump. Trump's charisma is enabled by his well-honed communications skills, combined with a personal conviction he has to the story he was telling. Trump is not traditionally known as a man of conviction, but if you watch coverage of him over the past three decades, you'll see that American Nationalism is something that has always animated him and defines his belief system. Bernie Sanders came from nowhere politically, with no national awareness, no fundraising machine, and, like Donald Trump, an untraditional political persona. Yet, he commanded national attention within a year while other Democratic candidates fizzled into nothingness (remember Martin O'Malley, Jim Webb, and Lincoln Chafee?). I think most would agree that it wasn't Sanders' classic good looks or his political identity as a Democratic Socialist that catapulted him into real contention to be the next President of the United States. It was charisma -- powered by decades of unbending belief that the key to American strength and economic prosperity was FDR-style Democratic Socialism. Conversely, Hillary Clinton was sorely lacking in charisma. It's true that she is known to be personally charming, but that is a different skill, and clearly not transferable onto the big stage. My thesis is that all of the supposed scandals that Hillary was implicated in, including Benghazi, the personal email server, and even her health, were all exaggerated and culturally sticky due to her distinct lack of charisma. With the right amount of charisma, she could have just as easily batted those issues away like Trump deflected issues such as not revealing his taxes, being implicated in fraudulent business practices with Tump University, and even the revelation that he bragged about groping women without their permission. The fact that Clinton's scandals were sticky and Trump's weren't was not a result of so-called media bias or gender bias -- it was directly correlated to charisma and its perception-bending affect on people. 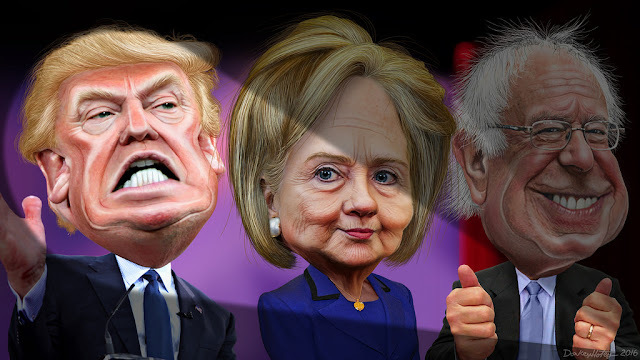 When comparing the three stand-out candidates this season, it becomes clear what creates charisma for national candidates. Right or wrong, Trump and Sanders both believed in something politically philosophical that animated their stories, their passion, and their audience. Clinton, on the other hand, appeared to believe that it was her time, and with her vast experience, we could trust her to do the right thing. This is a process belief, not a philosophical belief. Political polarization has always existed. Conservative minds and liberal minds perceive the world in fundamentally different ways, and it makes sense for people to seek comfortable company if given the choice. Historically, in order to find political alignment, people had to make some kind of investment. If you were conservative but born in a liberal environment, you needed to go out and find organizations, friends, or groups to affiliate yourself with like-minded people...or perhaps even move to a better-suited community. More recently, politically-oriented news and analysis outlets emerged (i.e., cable news, blogs, websites), which made it far easier to be philosophically comfortable than before, but you still needed to select the channel, go to the website, or subscribe to the specific feed you wanted. You still knew you were making a choice. In today's world, thanks to the introduction of the mass-personalization phase of technology, custom-tailored political polarization is now delivered to each of our individual digital doorsteps. Websites like Facebook track our behaviors and automatically deliver customized news feeds and posts that perfectly align with our political preferences. No more need to seek out like-minded people! No more having to pre-select your favorite politically-optimized information sources such as FoxNews or MSNBC! This wonder of technology-meets-content-curation allows us to consume and share politically-optimized content from the comfort of our own smartphones and computers without even having to select a channel. The result of this automated curation is what's known as a filter bubble, providing each of us just the facts (and, sometimes, non-facts) that support our preferred point of view. This is far different than choosing the information you want to be exposed to. With automated curation, most people will just presume that they are seeing the full gamut of information because they haven't been asked to self-select yet. Further, because of this pre-filtering, hundreds of new "news" companies have popped up to serve this need for self-re-affirming (real and fake) news and analysis. The result? Millions of people are exposed to agenda-based information mixed in with professional news in the same feed, and most people have very little idea how to delineate between the two. Sites like Facebook only benefit from your engagement, not how informed a citizen you become. If schools acted like Facebook, they would only provide courses that were aligned with each student's interests. For instance, if you didn't like math, you would never get a math class, and you may never meet a student who excelled at math -- heck, you may not even realize that math exists! That may sound great if you hate math, but do you really think this would be good for preparing you to succeed in the real world? First of all, great post, good points! This means that states with less urban voters have more say in the end result than states with more urban voters. To me this is a violation of democracy where every vote was supposed to have the exact same weight. Of course, one could also argue that the same imbalance is reflected in Congress, too, since we we don't vote on issues directly, but we elect certain people to represent us on issues. But the unfortunate result of our representative democracy is that 500,000 people in New York elect the same number of legislators as just 143,000 people in Wyoming. So, technically, less people in Wyoming provide the same weight on issues as over 3 times as many people in NY.